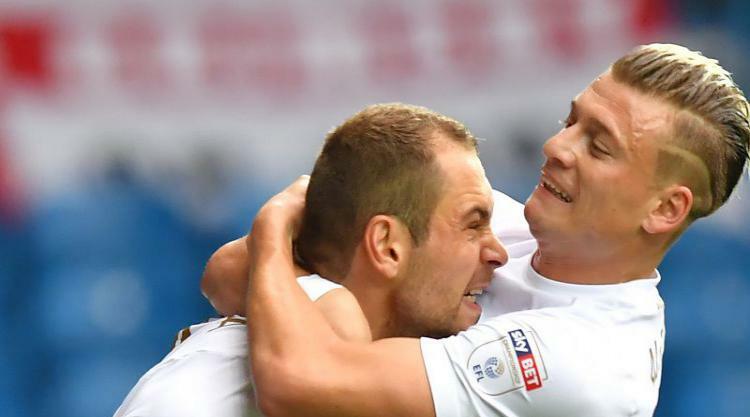 The status quo was maintained at the top of the Championship as Leeds, Cardiff and Wolves all won. Leeds remain at the head of the pack on goal difference, but the trio are locked on 20 points. United got the better of Ipswich 3-2 at a sold-out Elland Road. The Whites responded to a first defeat of the season away to Millwall last week, although this was not as comfortable a win as they would have liked. Pierre-Michel Lasogga put them ahead (13) but David McGoldrick replied with a free header (30). Kalvin Phillips hit back within two minutes, then Pablo Hernandez’s corner was dropped in by Bartosz Bialkowski, but Joe Garner got Ipswich back into it to set up a tense finish. Cardiff were 2-1 winners at Sunderland. Craig Bryson put Neil Warnock’s men ahead with his first goal for the club, before Lynden Gooch levelled from the spot with what was just Sunderland’s eighth goal at home in 2017. But the restless natives were sent home with more to ponder as Joe Ralls won it for City with a second penalty of the game. Cardiff and Leeds meet in Wales on Tuesday night. Wolves clung on to the pair thanks to a last-minute winner at home to Barnsley. Bright Enobakhare opened things up for Wolves with just 10 minutes left, only for Adam Jackson’s stoppage-time volley to level. But there was still time for Alfred N’Diaye to win it for the home side. Hull thought they were set fair for a first away win in 23 attempts as Fraizer Campbell put them 1-0 up at Reading, only for substitute Jon Dadi Bodvarsson to deny them with three minutes left. Brentford got their first win of the season at the ninth time of asking, beating Bolton 3-0 and leaving their opponents still searching for that elusive first three points. Yoann Barbet (38), Nico Yennaris (62) and Ollie Watkins (84) did the damage. Birmingham started life after Harry Redknapp with a 1-1 draw at Derby. City went ahead through Lukas Jutkiewicz but the Rams, managed by former Blues boss Gary Rowett, pulled level through Sam Winnall. One-all was the score at Craven Cottage as Fulham and Middlesbrough traded goals inside the last five minutes. Aboubakar Kamara put Fulham ahead but Cyrus Christie earned Boro a point. That was as far as the goal-scoring action went in the 3pm kick-offs, though, as Norwich and Bristol City, Preston and Millwall and QPR and Burton all played out 0-0 draws.